Motorcycle tours, Sri Lanka used to be provided with guide, mechanic and backup vehicle (Jeep). 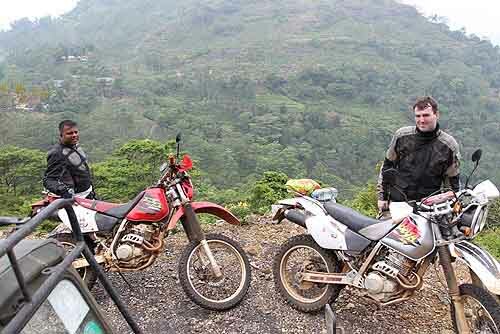 Motorbike tours are good for group of experienced riders. You will ride through many kinds of terrains and climate within short distance. You can ride through farm lands, river banks, beach sides, mountain regions and tea trails. Other than these places experience land full of sand, dry lands, mud range and perfectly laid asphalt roads too. Our tours are designed to take you between remote villages, beautiful towns via highways and rural roads. In some places you have chances to meet local pigmy people. We provide riding through single lanes through the forest trails. As you know Sri Lanka is an Island in tropical region, you can experience hot weather in low lands and cool weather around the hill country sides. Get to explore Sri Lanka on a Royal Enfield motorbike with Ceylon Tusker Tours. Enjoy mist in the morning, hot air in the day and cool breeze in the evening while you are cruising through the unexplored land with Ceylontusker Tours. 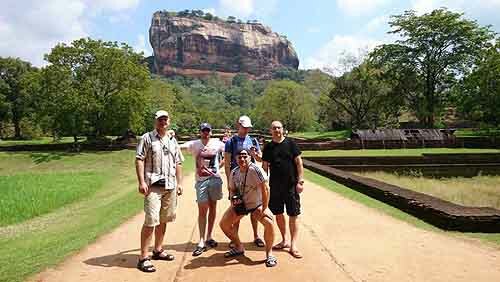 You can ride as a group with us in a selected Sri Lanka tour or rent a motorcycle and make your own tour on a motorcycle. Sri Lanka Motorcycle Tours 2019 Schedule. Our tours are priced at the low price. Your satisfaction is important to us. So adjusting your tour schedule according to your wish is not a problem. Accommodation throughout the tour is provided as per your selection. It can be from Star class hotels to Guest houses. Free Airport pick up and drop: Included. Mineral water bottles are provided free of charge, while you are on the tour. Free Sri Lanka SIM card with basic top-up money. (Run out of money in your mobile account? Re-load it with your cash). So bring an extra Smartphone.